We were delighted to have Christian Purslow as one of our special guests for a Q&A session at our AGM on Wednesday 16th January. Here’s an overview of what he had to say when quizzed by Trust members. Q1. Can supporters be auto-enrolled as members of the Trust as part of the season ticket renewal process? A. CP was not averse to the idea and would consider the matter. However, he was not in favour of imposing membership on all supporters and also the club needs to be mindful of other supporters groups. He does support the idea of encouraging all supporters to participate in groups that take an active interest in the club. Q2. Why has there been a lack of progression of players from the U23’s to the 1st team? A. A superbly functioning academy was a core pillar of the new owners’ strategy. 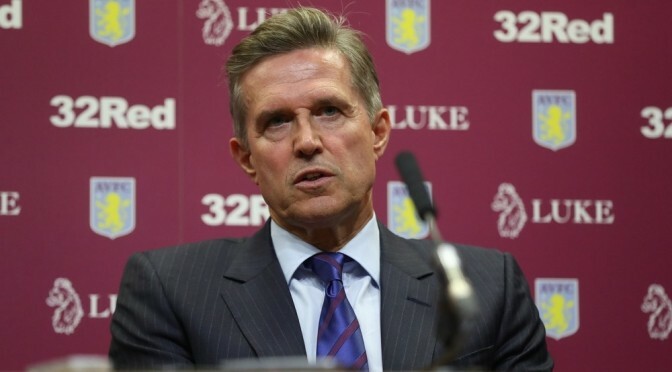 There was no value to the club of having players being paid to play in the U23’s who were not seen to have a future at AVFC. Supporters would see a change of emphasis even during the current window with players in the 18 to 21 age range being promoted to working with the 1st team squad at the expense of older players. Q3. How are the new owners tackling the issue of FFP (Profit & Sustainability) in light of the perilous financial position they inherited? A. It was a huge priority of the new owners to clean up the financial position of the club. The first stage had been to remove the debt from the balance sheet. This has been achieved with the significant equity investment by Sawiris and Edens. The second stage is to reduce the operating losses, this was now being addressed with the aim of dramatically reducing the average age and average cost of the playing squad. Q4. Why are under threes currently banned from attending games at Villa Park? A. CP was not aware of this and would look into it and report back. Q5. What are the plans to improve disabled toilet facilities? A. Money was now available to address all areas where investment is needed to improve the facilities and that this sort of expenditure does not impact on FFP (Profit & Sustainability). One area that was being addressed immediately was the tannoy system. Q6. There doesn’t seem to be a pathway for U23’s, whereas other teams such as Brentford have a strategy to develop their youth players. What are we doing to address this? A. CP reiterated the need to develop a strong U23’s and highlighted that the new coaching team attend all U23 games and that development of our own talent was a critical part of the new owners’ strategy. Q7. Would the upper tier of the Trinity Road stand be opened up for all games? A. Attendances for last 6 years were tracked and that the average attendance this season was up on previous seasons. However, the upper tier would only be opened if there was significant ticket demand. Q8. How much is promotion a priority? A. CP said that getting promoted was not a pre-requisite of the new owners. There will be no short term measures taken to chase promotion which would put the long term future of the club at stake. However, the club is not giving up on trying for promotion with the current squad many of whom do not have a long term future at the club. It is still the objective of the players and coaching staff. Q9. What has happened to Dr Xia’s share of the Club? A. Dr Xia’s stake in the club has reduced to about 25% following further investment by Sawiris and Edens. It’s expected that their stake will increase over time with further investment. Q10. Following the appointment of Dean Smith, what is being done about the development of a playing identity? A. The club wants to develop an attractive exciting playing style and hired Dean Smith precisely because he fitted that aim. They also want to recruit players who want to play that style. They also want this playing strategy adopted across all age ranges. Q11. Previous owners and CEO’s had promised the earth, what are intentions of new owners? A. CP assured fans that new owners are highly experienced understand the professional sport and will do it the right way. He also said that he wanted to be judged on actions, not words. Q12. How long will John Terry be at the club in a coaching role? A. CP explained that he thought the new coaching team were working really well together including JT and Neil Cutler. He hoped JT would be here for the long term. Q13. What is the likelihood of there being a Premier League 2? A. There is a gulf in terms of TV revenue between the bottom of the Premier League circa £100m and £7m for a team at the top of the Championship excluding parachute payments. Many of the leading Championship clubs are working on a sustainability project to work for a fairer distribution of TV revenue and trying to garner the support from Premier League teams; it needs to make a change that will be better for football generally.